Starting out as a young trainer on my journey to train dolphins I quickly learned that positive reinforcement made the world go round at Dolphin Quest. 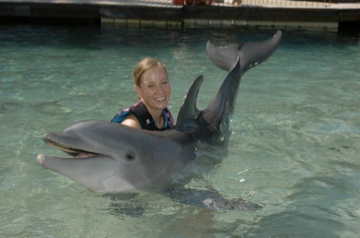 The positive reinforcement used for the dolphins included the trainers’ whistle and a variety of fish. This combination was the key to getting these dolphins to offer everything from keeping their mouths open for morning teeth cleaning to offering a 30-foot high jump. The arrangement was also quite simple, every behavior the dolphins offered correctly earned a whistle sound followed by a fish. All we relied on was the positive consequences we could provide them which not only gave us close to 100% correct responses but also decreased incorrect responses. Incorrect behaviors were simply ignored. Adding any sort of punishments, like slapping on an electric collar for incorrect responses was impossible with a 500lb. dolphin. The dolphins learned that if they wanted to hear that reinforcing whistle and earn their lunch they would need to respond to the trainers’ cues correctly. There was also another factor that weighed in on our training program and that was motivation. We regulated their intake of food everyday so their motivation would last throughout the daily check ups and meet and greets with guests. If the dolphins received their entire food intake in the morning there would be no point in responding to cues because there would be no incentive. In combining the motivation and positive reinforcement we could amaze guests with their brilliance and aptitude. The combination not only allowed us to work with the dolphins all day but also kept them mentally and physically stimulated throughout their daily routines. In coming face to face with the dolphins I would often hear guests laugh and say, “Wow if I could only train my dog to be this good”, and our response would always be, “You can!” The same program used with the dolphins can be passed on to not only train a variety of animals, but also man’s best friend. Most of the time, there is no need for strong punishments or corrections in a training program with dogs. All that’s needed is a positive, motivational training plan in which your dogs can operate on their own environment and learn what earns good stuff and what doesn’t. There’s no need for us to continually be bossing our dogs around and physically placing them into a sit or down or in their crate. If you can make all those behaviors motivating and rewarding enough for your dog, you’ll see your dog making the choice on his or her own to go in the crate, lie down or to sit instead of jump. Don’t forget that as a dog owner it’s not your job to make your dog do certain things but to make it rewarding enough that your dog actually wants to. Become a kind and benevolent leader in the New Year for your dog and experience a whole new relationship in 2011!